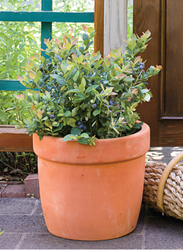 The newest addition to the BrazelBerries Collection, Pink Icing plants have breathtaking spring and fall foliage. Whether you over winter the plants indoors or out depends on your climate. The colder it gets, the more protection plants need. The BrazelBerries Collection of blueberry and raspberry shrubs that grow easily in containers or gardens are a snap to care for over the winter with some simple steps. Most varieties within the BrazelBerries collection can take cooler temperatures and actually need a certain amount of chill to set fruit the next year. The blueberry varieties Jelly Bean and Blueberry Glaze and the thornless Raspberry Shortcake raspberry all are specifically bred to survive during cold months either inside in a protected spot or out in the garden or landscape. Peach Sorbet and Pink Icing blueberries may need a bit more protection during extreme cold spells. Most plants can withstand more cold if planted in the ground where roots are protected. BrazelBerries varieties planted in patio pots generally need more protection with the roots above ground and less protected. “Whether you over winter the plants indoors or out depends on your climate. The colder it gets, the more protection plants need,” explains Amelie Brazelton Aust, a second-generation owner of Fall Creek Farm & Nursery. Aust says the key to overwintering BrazelBerries is to keep the roots from freezing and cold winds from drying out the plant’s branches. Here are some simple tips for different regions of the country to overwinter BrazelBerries both in pots and in the ground. Whether inside or out, the BrazelBerries blueberries go dormant and drop most of their leaves. Don’t worry. They may look dead but aren’t. While still dormant, prune blueberry shrubs in late winter to shape the plant and remove dead or damaged stems. Remove approximately 1/3rd of dead or lateral stems. While it may seem counter-intuitive, remember that pruning actually encourages fruit set in the spring. Raspberry Shortcake will go completely dormant and look dead. This is perfectly normal. Wait until early spring to prune Raspberry Shortcake. When fresh green growth emerges from the base of the plant and some of the stems, cut dead canes at ground level that show no sign of green. BrazelBerries shrubs don’t need much water while dormant, but if planted in pots check them once a month. If the soil is dry more than an inch deep, water lightly but don’t soak the soil. If covered with snow, they’ll be getting plenty of moisture. BrazelBerries growing in patio pots in USDA Zones 5 and below need to be moved to a sheltered spot when nighttime temperatures drop below freezing – especially in extreme cold spells. An unheated shed, garage, basement or greenhouse works well too. If the plants must be left outside, move pots together against a protected part of building that provides shelter and pile four to eight inches of straw mulch in and around the pots, but don’t pack mulch against the plants’ stems. Or wrap the container in several layers of burlap or insulating material. 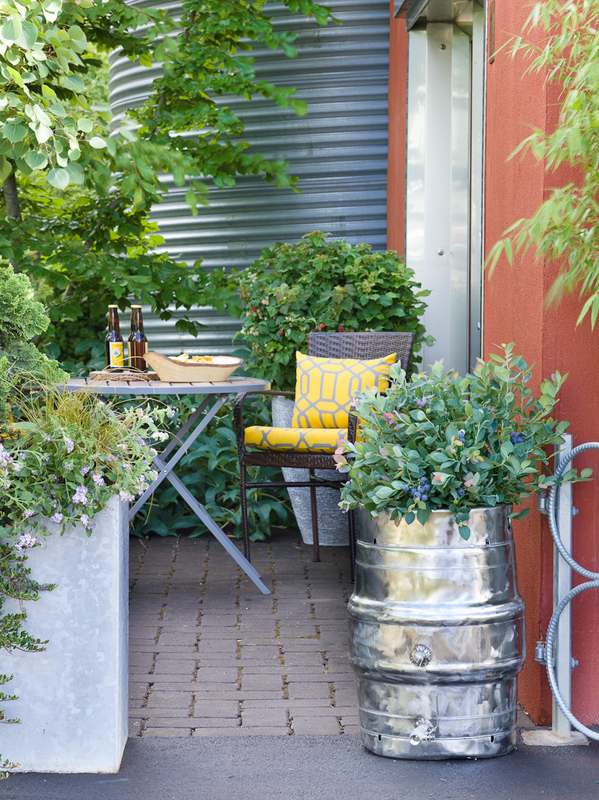 Generally in Zones 6 and up, BrazelBerries in containers can be kept outside in a sheltered place, such as under the overhang of a building or against its north side. Cluster pots together, give them a good watering, and cover them with leaves or straw, or wrap in layers of burlap. Just remain aware of any extreme cold spells and provide any additional insulation or shelter as necessary. In the warmest areas of the country, where it rarely freezes, BrazelBerries can be left outdoors in their pots year-round. Grown in the ground, BrazelBerries have proven to be tough plants that handle the cold and come back even bigger and better the next year. Freelance garden writer Deb Wiley, from Des Moines, Iowa, grows all her BrazelBerries right in the garden. “I do nothing – nada – to winterize my berries. I don’t even add extra mulch. They even survived last year’s Iowa winter, one of the coldest on record!” proclaims Wiley. Once spring comes, be on alert for cold snaps and cover plants if frost is predicted. This protects the tender new growth, budding flowers and delicious harvest! BrazelBerries blueberries Peach Sorbet, Jelly Bean, Blueberry Glaze, Pink Icing and thornless raspberry Raspberry Shortcake were created specifically for the home garden. 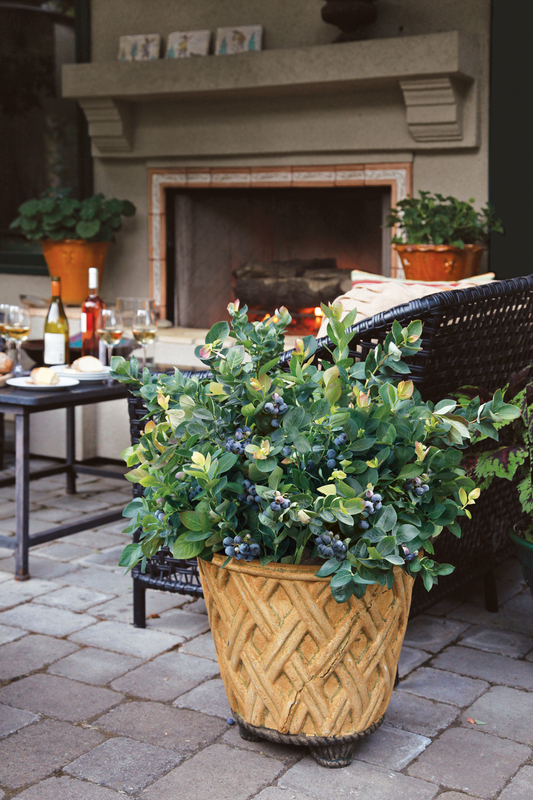 In addition to the fruits’ luscious flavor, these colorful landscape shrubs are perfect for patios, balconies, decks, or anywhere you want a bit of beauty and a tasty snack. For more information on Fall Creek’s BrazelBerries collection, visit brazelberries.com. Fresh blueberries are now found just a step away from the back door with the Brazelberries® Collection of small edible berry bushes. Packed with health benefits, easy to grow and compact patio blueberry BrazelBerries are quickly becoming a staple in every garden.